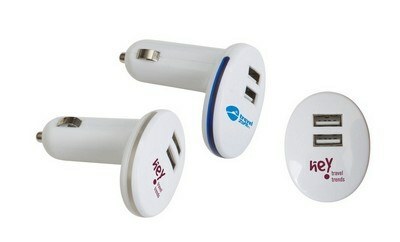 With the Double USB Car Charger, you don’t have to worry about running out of charge while on the move! You can recharge two mobile devices at a time within the comfort of your car and stay connected always! It features a bright LED ring that illuminates with a white glow when plugged in. 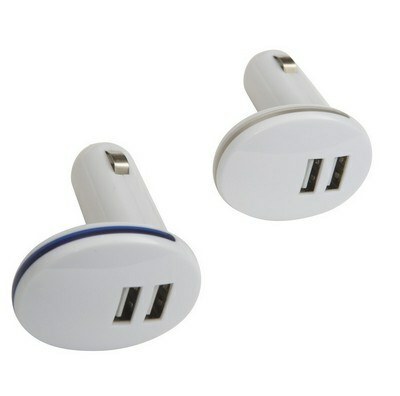 Whether it is an urgent business call or to communicate to your family an important message, the Double USB Car charger comes in very handy. With the Double USB Car Charger, you don’t have to worry about running out of charge while on the move! You can recharge two mobile devices at a time within the comfort of your car and stay connected always! It features a bright LED ring that illuminates with a white glow when plugged in. Whether it is an urgent business call or to communicate to your family an important message, the Double USB Car charger comes in very handy. Imprint your company logo and message in this unique product and promote your brand in double quick style!